Lately, I’ve been swamped with work and feeling rather unmotivated. Hence, I haven’t been writing as much as I would like to. I would love to move on to write about other things (non-travel related). But being someone who loves to write chronologically, that is only possible after clearing my May 2017 Bali travelogue. So do bear with me as I try to clear as many posts/videos as I could in the coming weeks. Moving on to day 2 in Alila Seminyak, our day started as early as 07:00 with an Alila Experience known as ‘Divine Healing’. After meeting up with two guys from the Leisure Concierge’s team, we followed them and made our way to the beach. The journey started with a leisure stroll along the beach until we reach the venue for our morning yoga. As it took us a while to get there from Alila Seminyak, we only managed to squeeze in half an hour of yoga (supposed to be an hour) with our yoga instructor. 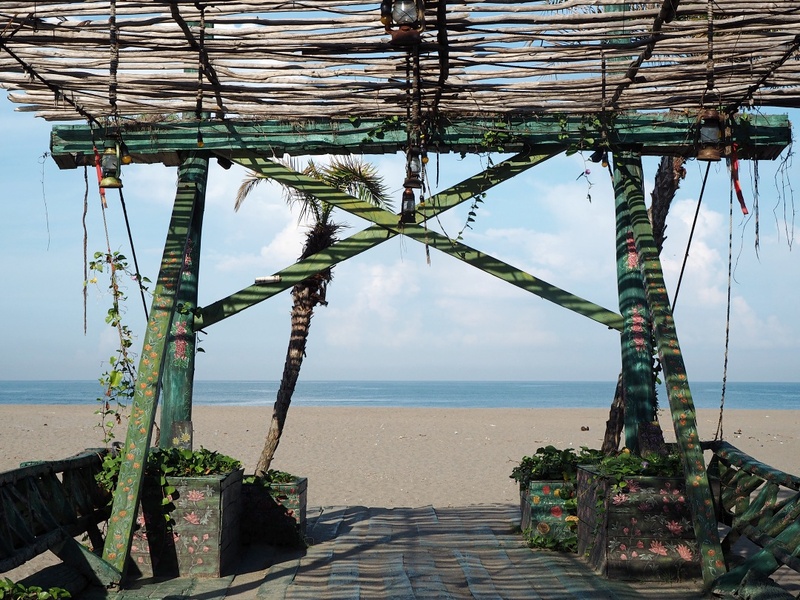 After our short yoga session, we then proceed to a nearby local temple, located on the beach. There, we met up with our temple priests (a married couple) and got to witness how they did their morning prayers. We were welcomed to join them for their morning prayers and received a blessing from the gods. The journey didn’t just end there. Leaving the temple, we hopped onto a Volkswagen Kombi (similar to the one we went on the day before for our Alila Experience: ‘Rom-Antique Roadshow’) and followed the priests back to their house. We were warmly invited into their home and were told to sit on the floor while the priest performed a personal spiritual healing for each of us. Overall, it was an eye-opening experience. While this may not be my favourite Alila Experience out of all those we did (in Alila Seminyak and other Alila’s resorts), I would say it’s sort of interesting to witness how the locals did their prayers. 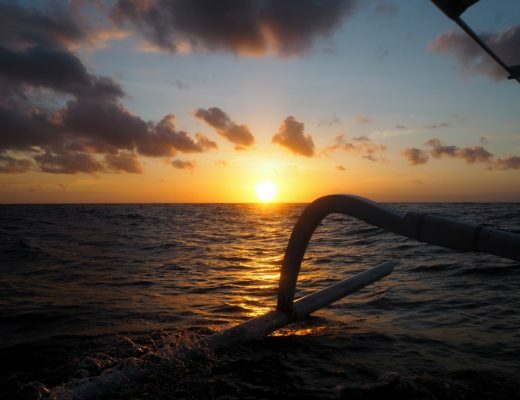 For those who are looking for authentic Balinese experience, this is undoubtedly an activity worth considering. Price for this Alila Experience (‘Divine Healing‘) is at IDR 2,000,000++ per person. You can check out the video I posted on Youtube if you’re keen to learn more about this experience. 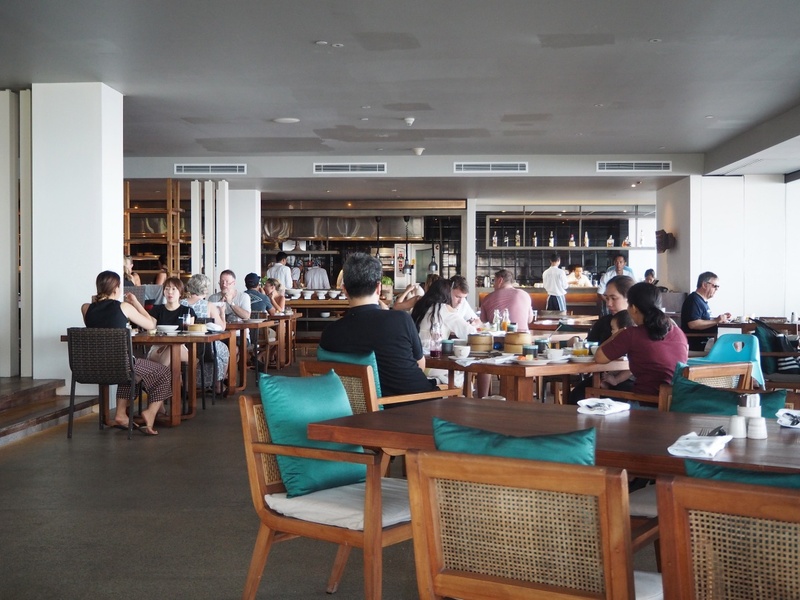 After an eventful morning, we made our way back to Alila Seminyak for breakfast at the restaurant. There aren’t many changes in their breakfast’s menu, and since I’ve written about it in my previous blog posts, I shall not go into details. 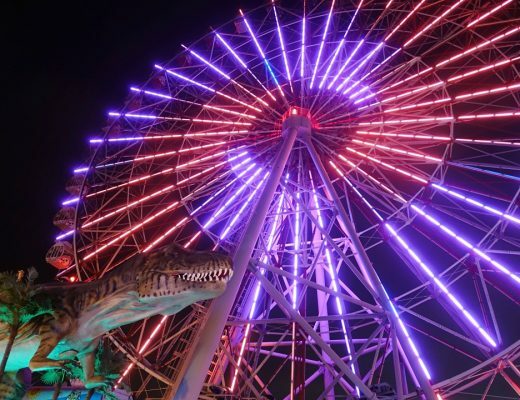 To briefly sum up, guest can either order from the menu, or pick up ala-carte dishes from the counter. I didn’t take a picture, but my favourite food was the congee, paired with chicken slices, peanuts and light soya sauce. Done with breakfast, I then spent the rest of my morning/early afternoon in the room to finish up some work; while the Fiancé and our business director head out for a meeting. 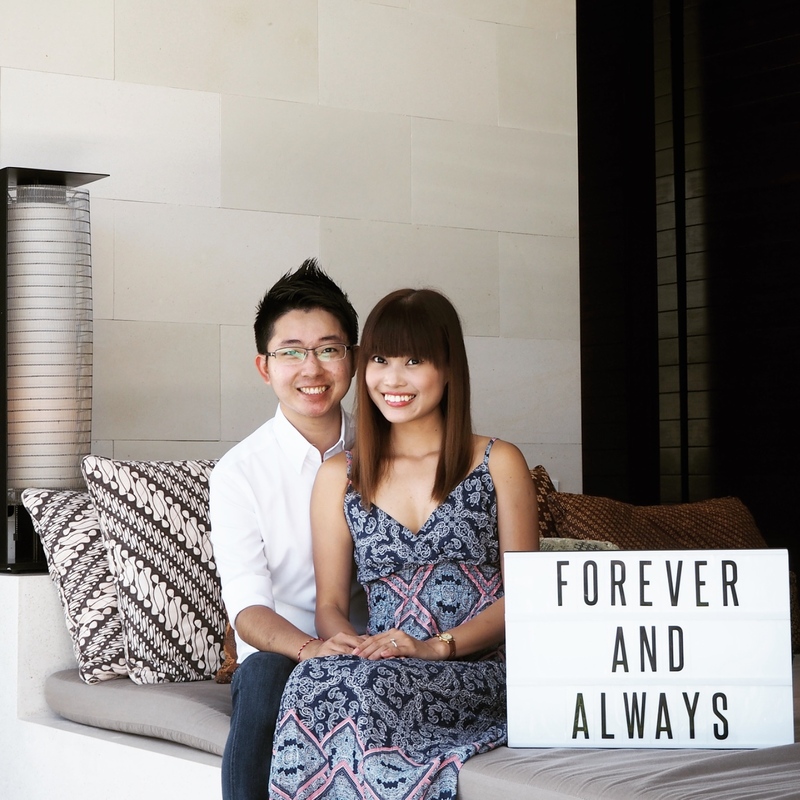 We had a second Alila Experience scheduled in the afternoon, and the plan was to wait for them to return from their meeting and went for it together. I wouldn’t say I was surprised when their meeting overrun and they ended up coming back late. In the end, I decided to wait for them to return and postponed our activity to 16:00. Once they got back, the three of us then headed down to the lobby to meet up with a lady from Alila Seminyak’s Leisure Concierge, who then led us to the temple. The temple we went to was none other than the one located within the resort. 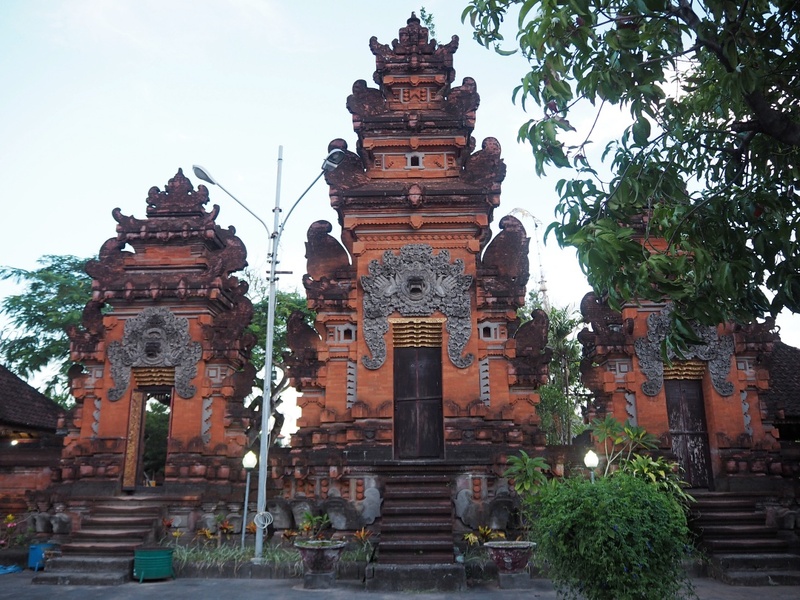 Situated right next to the restaurant and party pool, the temple was around way before Alila Seminyak was built. Taking into account that the temple is in use by the landowners and their families, the temple was minimally restored and reframed by a reflective pond. Even though I’ve walked past the temple multiple times, I have never once stepped foot into the temple. This was, in fact, the first time I took a closer look at the temple. Despite being right next to the pool and ocean, the temple commands a calming presence. 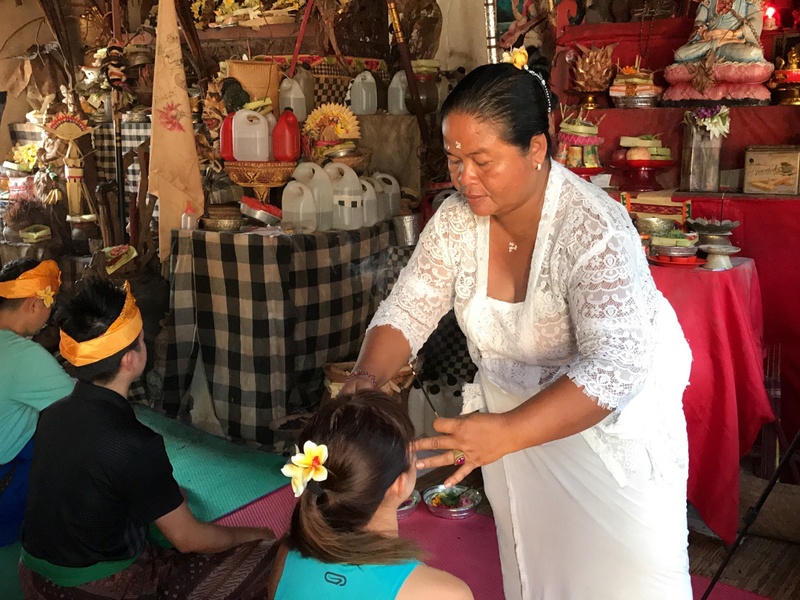 Having given some background information about the origin of the temple, we then got down to learning how to make the Canang Sari offerings, as well as the ‘Gebogan’ – a beautifully decorated fruit tower. The above is what they called the “Canang Sari”. 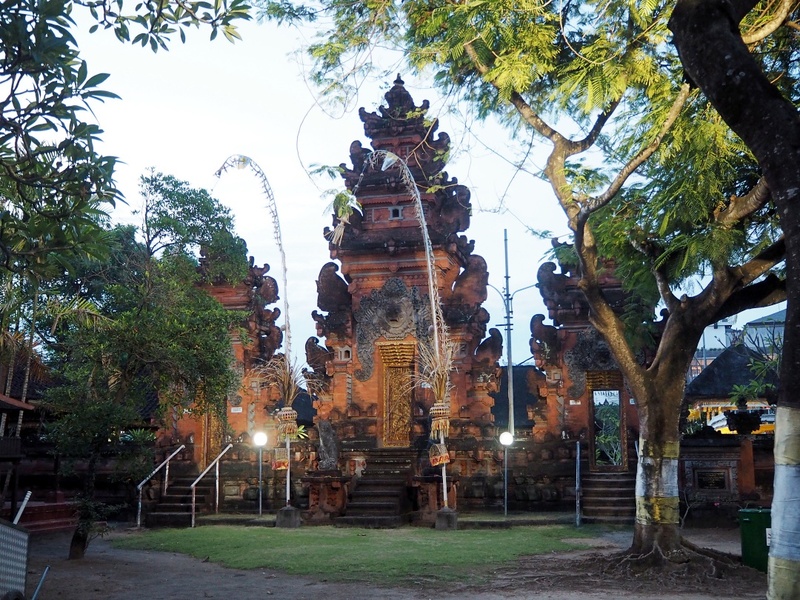 It is one of the daily offerings made by Balinese Hindus and can frequently be seen on the ground in front of houses, shops and temples. I remembered being intrigued by this the first time I came to Bali, as I kept seeing them on the streets. 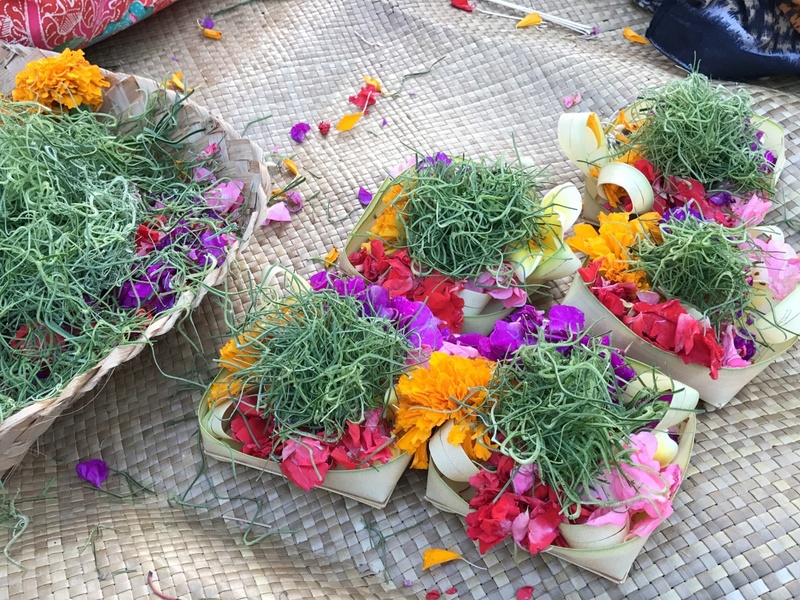 The Canang Sari consists of two parts, a tray made from palm leaf and the coloured flowers placed on the tray. Did you know that there is a specific placement of the flowers? Like the red-coloured flowers are meant to be placed on the south, and the yellow-coloured flowers are placed on the west, etc. While pre-made Canang Sari can be purchased from the market, most of the Balinese Hindus preferred to make their own from scratch. Afterall, the philosophy behind the offering is self-sacrifice in that they take time and effort to prepare. 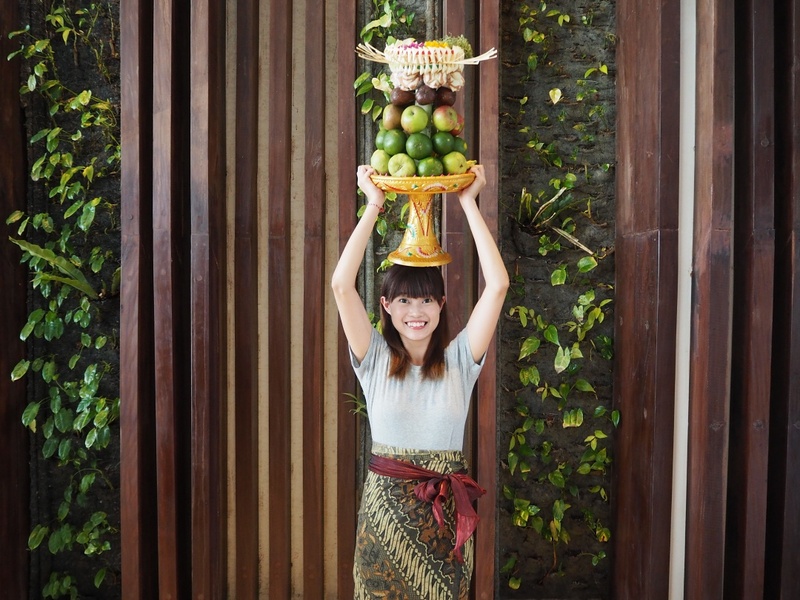 Aside from Canang Sari, we also got to learn to prepare the Gebogan, a beautifully decorated fruit tower. This offering is a symbol of gratitude to the gods and can often be seen carried by women on the top of their head. The offering is usually made using fruits and traditional cakes that are arranged from bigger to smaller to form the required shape. We first have to stick the fruits onto the bamboo sticks, then insert them to the ‘core’ of the tower (made from the stem of banana sapling). While it may sound easy, it actually took the guys a lot of strength and time to arrange the fruits nicely together. Thankfully, we were able to complete it with the help of our guide. Having completed our Gebogan, the next step was to deliver it to the temple. While waiting for the arrival of our buggy to get us to the Petitenget Temple, I asked if I could try carrying the Gebogan on my head just to find out how heavy it is. It’s freaking heavy! I guess I didn’t expect it to be that heavy since she managed to carry it and walk with such ease and poise. 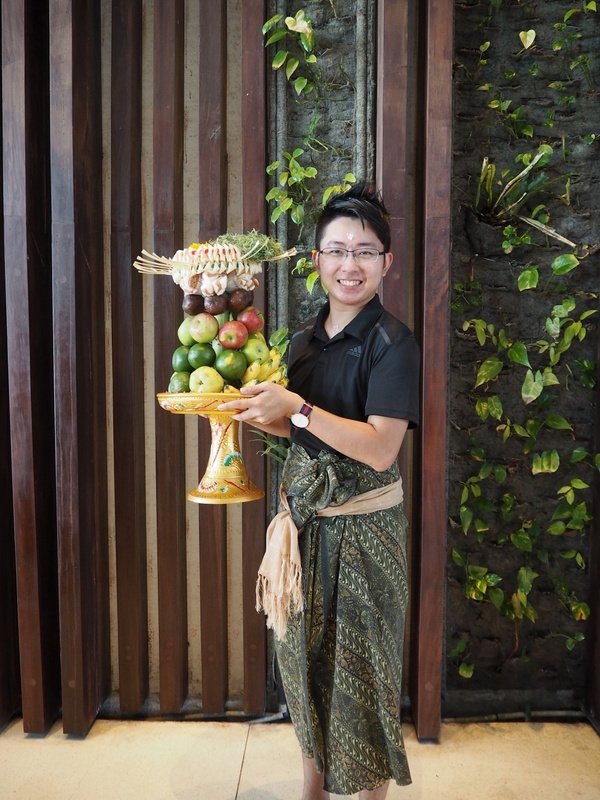 While half of the weight comes from the fruits, another half must have come from the ‘Dulang’ (offering bowl made from wood). Even the guys who tried to carry it on their hands was taken aback at how heavy it weights. Over at Petitenget Temple, we then set the Gebogan down and did some praying. 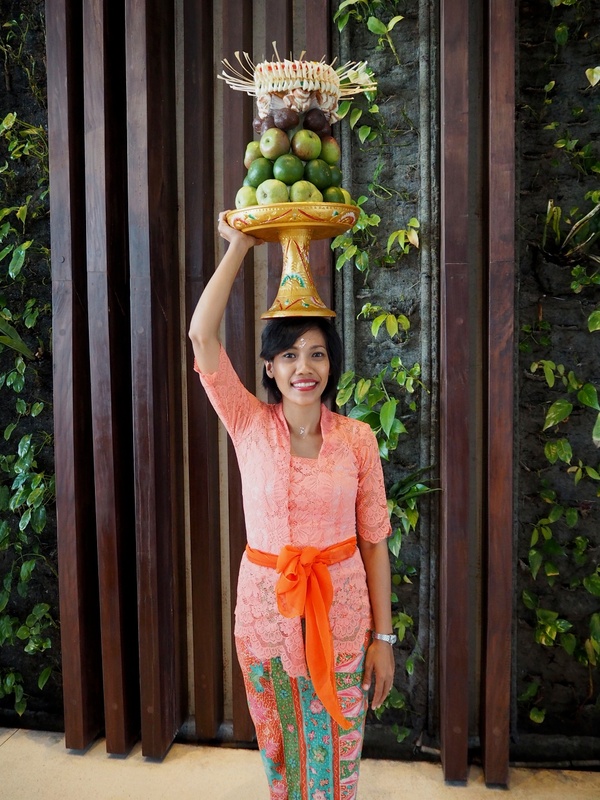 After performing a simple ritual, the fruits/traditional cakes were brought back to the resort. Apparently, we were to eat them as a form of blessing. All in all, it was an engaging experience, and I did find myself walking away knowing and understanding more of Balinese Culture. It was interesting to learn about the making of the Canang Sari offerings. For those interested to sign up for this Alila Experience (Inspirational Bali), it’s priced at IDR 625,000++ per person. The entire activity takes approximately three hours. 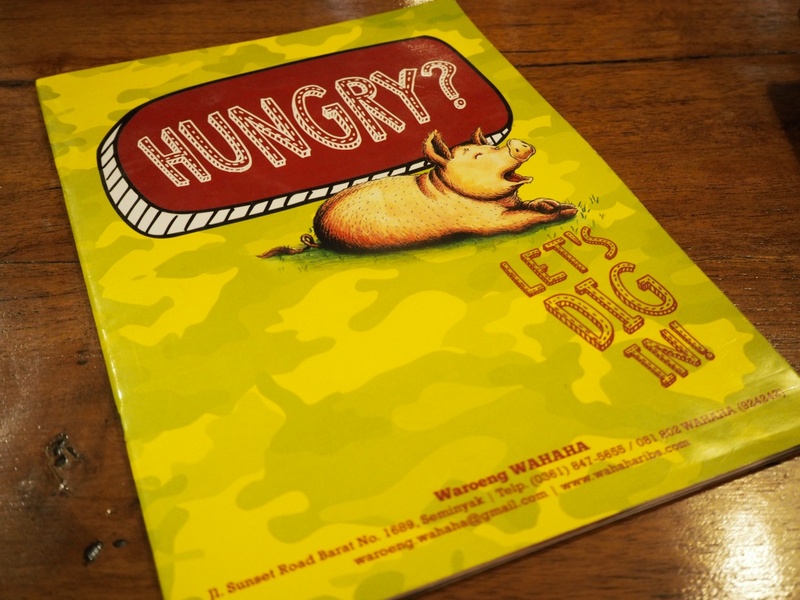 Having gone through a busy morning/afternoon, our night was spent relaxing over a sumptuous dinner at Waroeng WAHAHA. 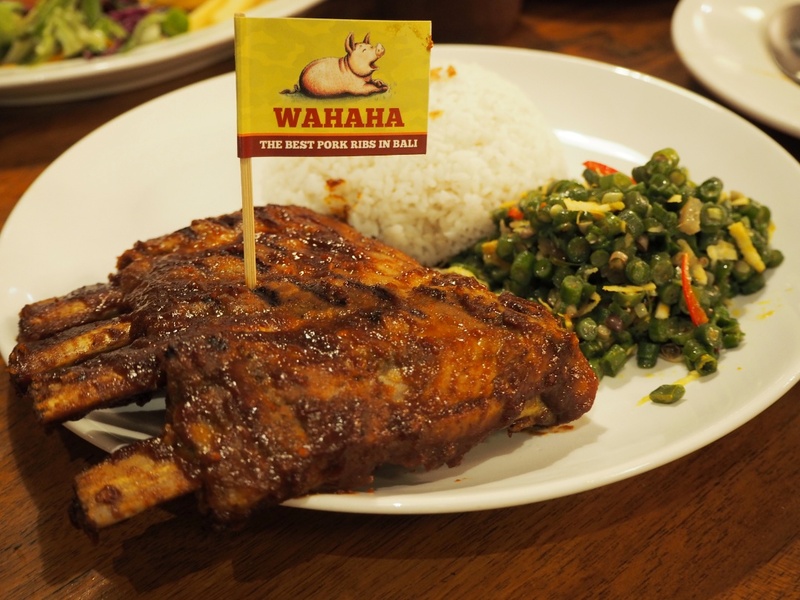 The Fiancé and I love the pork ribs from WAHAHA, hence, we really want to introduce it to our copywriter and business director. The place isn’t far from the resort, and we got there by a Grab car. 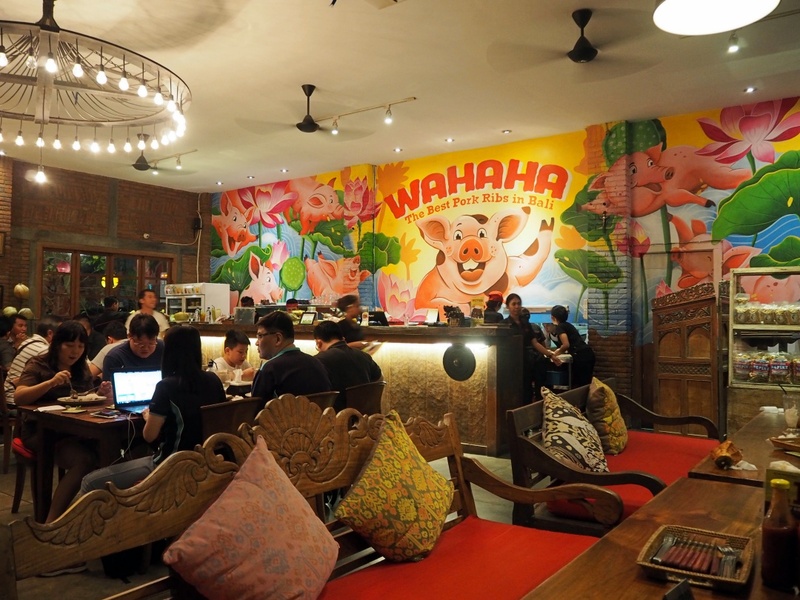 They have revamped the place since our last visit, and the entire warung looks much brighter now. Since there were four of us, we were able to order a few dishes for sharing. 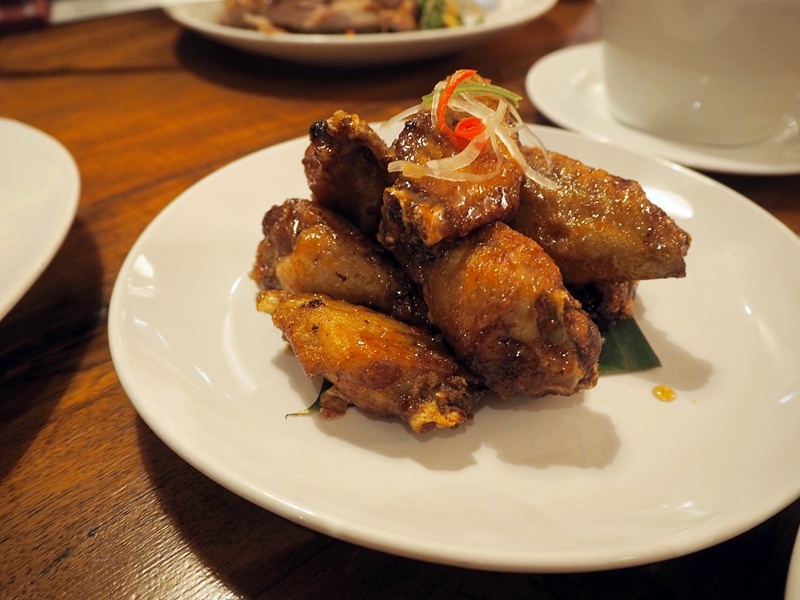 On the table, we have the signature pork ribs, the spicy pork ribs, ayam goreng, bebek goreng, honey garlic chicken wings and mashed potato. (The pork ribs came with French fries, rice or mashed potato and fresh salad.) 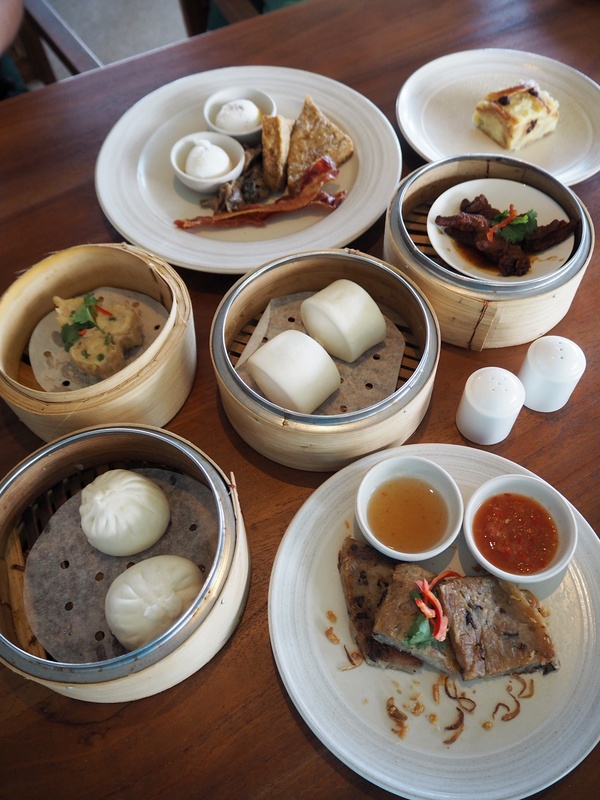 Together with four drinks, we paid IDR748,700 for our meal. We ordered two of the spicy pork ribs, and they turned out to be really spicy! Even I have difficulty eating it. So, depending on your tolerance to spiciness, you may or may not enjoy it. 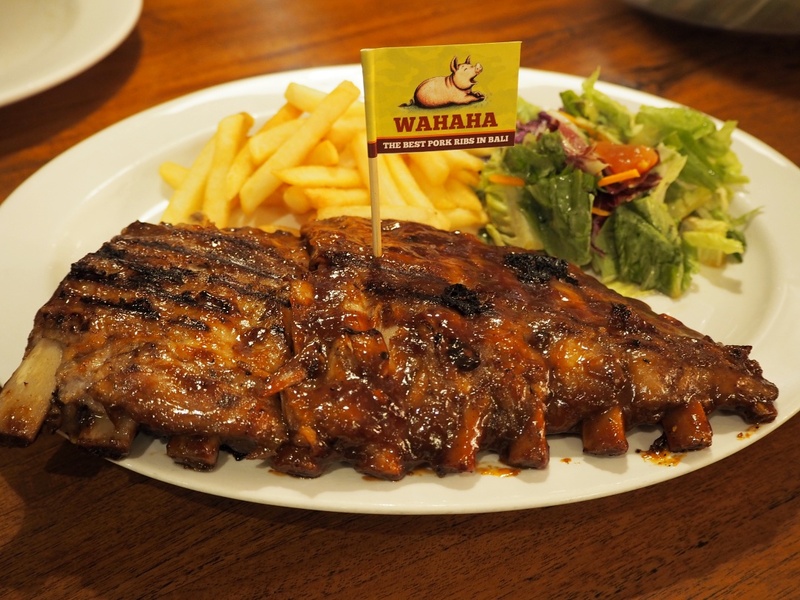 I can’t take the spiciness; hence, I prefer the WAHAHA pork ribs. I hoped they had enjoyed the food as much as I did. 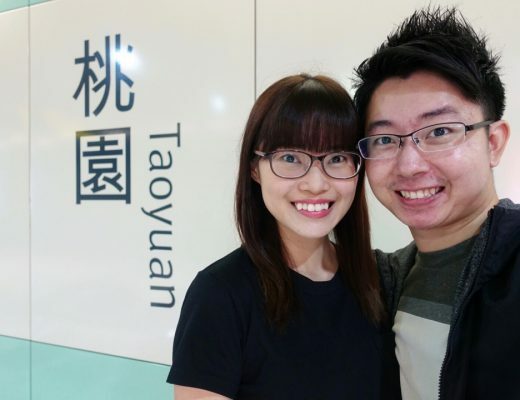 This place came highly raved on many review sites, and I really love the food there. I wouldn’t say the foods there are cheap, but they are affordable and definitely less expensive as compared to if you were to have the same food in Singapore. 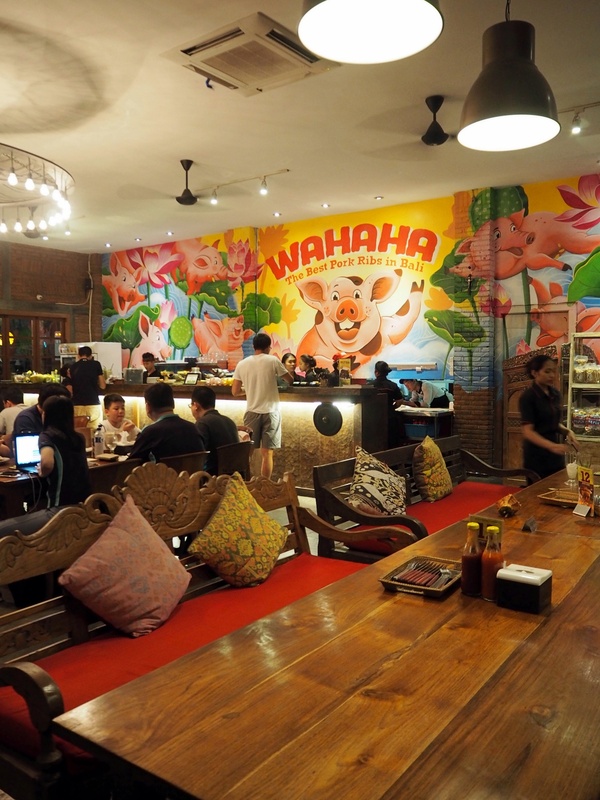 The warung is located within walking distance to Sunset Point Shopping Centre, along Jalan Sunset Road. I supposed it’s considered within Seminyak area? We always went there via a Grab car. 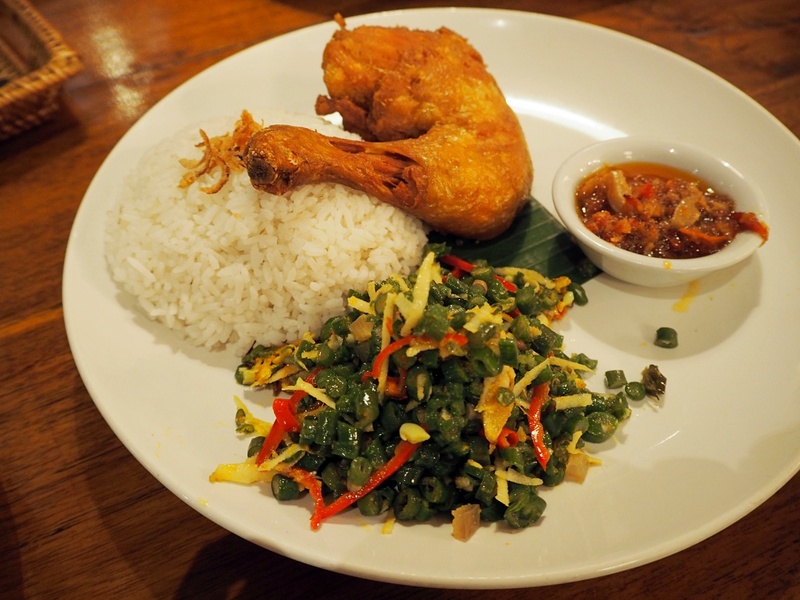 So if you’re staying in Seminyak or happened to be in the vicinity, you can perhaps consider heading there for dinner. They are opened till 22:00 and last order is at around 21:20 / 21:30.